Starting in January I will be venturing into a journey of self-improvement. 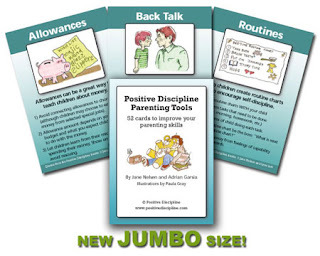 Specifically...a journey of improving my parenting skills using the Positive Discipline Parenting Tool Cards. I took this journey once before in 2010 and it helped me stay focused on my parenting throughout the year. I learned a lot from that experience and I am excited to put that new knowledge to work this coming year. One thing I learned is although I will involve my kids in this process, I won't specifically tell them that I am using new parenting tools. I found the first time around that my son used that information as a chance to sabotage my efforts. I think it will be better this time if I just start using the parenting tools and allow them to be pleasantly surprised when our family life becomes more respectful and loving. The second thing that I learned is that it is helpful to be reading a companion Positive Discipline Book during the journey. Since my children are teenagers, I will be reading Positive Discipline for Teenagers. If I make a commitment to read a little each day from that book, it will help me stay focused and positive. The third thing I learned is to be persistent. Sometimes it takes time for children to learn new habits. And sometimes when you think they've got it, they revert back to their old ways. This is just a fact and it takes persistence. Positive Discipline is focused on the long-range results. Some of the benefits may not appear until they go off to college on their own. So we need to allow our children to make a few mistakes and learn the skills they will need later in life. I look forward to sharing my experiences with you and I hope you will share your comments along the way. I participated in your journey, and learned a lot from both you and the other blog followers, for a few months in 2010. Looking forward to having a bit more persistance this time around! My son is now 6 years old, so it is a good time to refresh the skillset and adapt them to a new era. Thanks for taking the initiative! Hi Brad, I bought the cards and am ready to go. I've actually had them a few months ago so really I wanted to say thanks for the nudge. My kids are 10 and 12. I'll be working on this right alongside you. Thanks for taking the lead and helping us along! !